Home → Painting Classes → How to Paint A Palm Tree at The Beach. 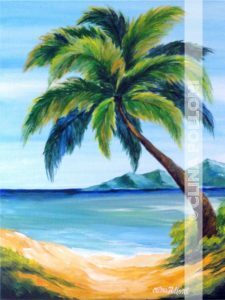 Painting Class Taught by Artist Clina Polloni. 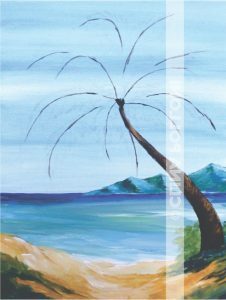 Learn to paint a palm tree at the beach with clear waters of the ocean. This seascape painting was created for the painting classes, is a simple and charming painting for a person that is starting to paint. Do an acrylic under-paint, using Cerulean Blue and Titanium White with water to impregnate all the surface of the canvas. Continue with acrylics or oils. Paint the sky, ocean, mountains and beach. Brushes, multi-purpose, polyvalent. There is a 10pc “Artist’s Loft” that provides most of the brushes for the beginning or the Pro Stroke-Power Creative Mark of Jerry’s Arterama. Also, Wal-Mart has some fine and medium gold taklon brushes. For Oil paintings, the best media is Refined Linseed Oil with Refined Turpentine. To clean the brushes Turpernoi. I have some glass containers to mix media. Paper towel, Pencil to draw. Member of The Franklin County Art Council and Wake Forest Guild of Artists, of North Carolina.